Successfully Added VKWorld Mix Plus Android Phone - Bezel Less Display, 5.5-Inch, Android 7.0, Quad-Core, 3GB RAM, Dual-IMEI, 4G (Blue) to your Shopping Cart. Enjoy your favorite media like never before on the 5.5-Inch bezel less display of the VKWorld Mix Plus Android Phone. This smartphone treats you to a stunning edge to edge display that comes with barely any bezels. Thanks to this, it truly treats you to a limitless HD visual experience. Whether it’s games, movies, or Apps – this Android phone is sure to impress. It comes packed with a powerful battery that lets you enjoy all this stunning phone has to offer throughout the day. With this beauty in your pocket, you’ll always be able to undergo a cinematic experience no matter where you’re at. Underneath its breathtaking HD display, the VKWorld Mix Plus Android smartphone packs a sophisticated Quad-Core processor and 3GB RAM. With this phone, you’ll be able to enjoy the latest software features without ever needing to worry about slowing down your device. It furthermore treats you to a sufficient 32GB internal storage and a 32GB SD card slot. This means that you’ll always have enough memory at your disposal to store the latest media acquired through Google Play. With two IMEI numbers, this latest Android phone brings along great connectivity. You can slide in two SIM cards and stay connected to both of them at the same time. If you are looking for an Android phone that lets you efficiently separate work and private life, the VKWorld Mix Plus is perfect for you. Additionally, it also supports 4G. This means that you can always take advantage of the fastest mobile data speeds out there. Whether you’re at home, in the office, or enjoying a day out – this Android smartphone keeps you connected at all times. 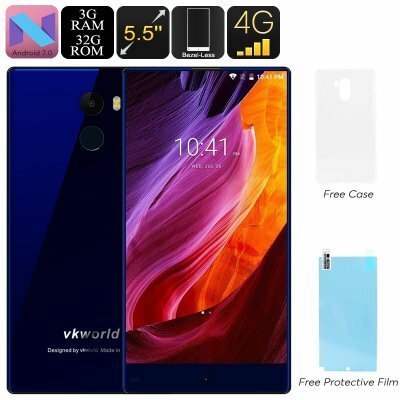 The VKWorld Mix Plus Android phone comes with a 12 months warranty, brought to you by the leader in electronic devices as well as wholesale smartphones..